OPB Aug. 22, 2017 12:01 p.m. | Updated: Aug. 23, 2017 12:57 p.m. THE DOCTOR FIX: A NEW ERA OF MODERN MEDICINE explores America’s evolving healthcare system. Through compelling scenes and in-depth interviews with patients, doctors, healthcare experts and stakeholders, this hour-long documentary reveals a profession in transition that impacts the lives of patients everywhere. THE DOCTOR FIX is being fed by NETA to public television stations on August 26, 2017. Today, physicians face a complex web of scientific advances, technological innovations, complicated revenue streams, and political mandates. The Affordable Care Act drives many of these changes for doctors in the United States, ushering in a new era of American medicine. The pressure can be overwhelming. These doctors face the choice of changing the way they practice medicine or shutting their doors. Yet with all these challenges, a revolutionary time in healthcare could be on the horizon. Today, there is an increased emphasis on prevention and wellness, a new perspective on team-oriented, patient-centered care and advanced technology that can change how doctors and patients interact and the way health data is collected. THE DOCTOR FIX explores the real-life impact of the Affordable Care Act on both doctors and patients. 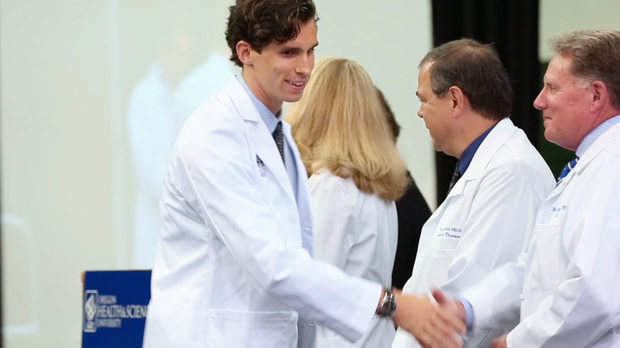 Inspired by co-producer Dr. Jeffrey Weisz’s book, “It’s a Great Time to be a Physician,” the film brings to life the intersection of the old and new models of health care. THE DOCTOR FIX brings to light changes in the fabric of the health care system, the evolution of the business of being a doctor, and what we all can expect as patients in this new era of American medicine. THE DOCTOR FIX: A NEW ERA OF MODERN MEDICINE is produced by Kate McMahon Productions, LLC and presented by Oregon Public Broadcasting for public media distribution through NETA.